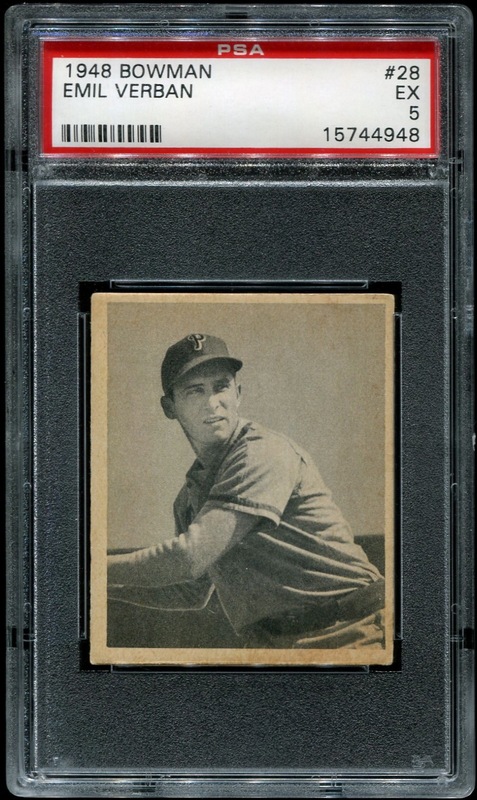 The first card I added to my collection in 2013 also happens to complete my 1948 Bowman team set. Admittedly, the set comprises just two cards, but given the scarcity of the two cards (they are both short prints) acquiring them in nice condition at a reasonable price isn’t always a given — especially if you are a collector who insists on buying them graded when dealing with cards that are over 60 years old. Yes, I know the caveats regarding graded cards, but to me spending a few extra bucks is absolutely worth the extra little piece of mind when it comes to alterations and actual card grade. The oddity about the two Phillies in the 1948 Bowman set that intrigues me is that both of them had the first name “Emil” — the other being Emil “Dutch” Leonard. I realize that the popularity of names ebbs and wanes over the years, but what were the odds in 1948 that any team would have two players named “Emil”? Well according the Baseball-Reference.com, there were only three Major Leaguers in 1948 with that first name, and two of them were with the Phillies. Not to be outdone, the Chicago Cubs, who had Emil Kush on their roster, acquired both of them midway through the 1948 season and until 1950 enjoyed a monopoly on all the MLB players with that first name. I believe this is likely the most useless piece of trivia I’ve personally unearthed.